(Bloomberg) -- Across vast tea plantations that sit atop the rolling hills separating two of Indonesia’s largest cities, excavators dig out a series of giant tunnels for the country’s first high-speed rail line. 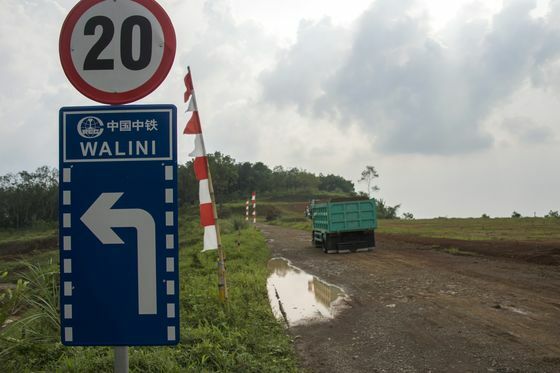 The $6 billion project linking the capital Jakarta with Bandung some 150 kilometers (93 miles) away is expected to cut the travel time between them to about 40 minutes. The journey now takes about four hours on a road clogged with trucks packed to the brim, and it can easily double when the wet season brings daily downpours. In theory, the project should be a point of pride for President Joko Widodo, the man popularly known as Jokowi who holds a commanding lead heading into an April 17 election. But it’s been hampered by delays, and even members of his own administration have raised concerns over the transparency of its financial backer: China. “The Jakarta-Bandung high-speed train represents everything that’s wrong with Belt and Road,” Tom Lembong, Indonesia’s investment chief, said in a March interview, adding that he still remains a supporter of Chinese President Xi Jinping’s ambitious plan to finance global infrastructure. “It’s opaque and non-transparent -- even us cabinet members are having trouble getting data and information,” Lembong said. While he doesn’t doubt that the populous area can sustain a network of high-speed rail lines over the next few decades, he called the project “deeply troubled” and lamented the lack of financial modeling or due diligence. Those sentiments are shared by Prabowo Subianto, who is challenging Jokowi for the presidency. To make up ground in the polls, the former general known by his first name is in part tapping into anti-China sentiment that has a long and occasionally ugly history in Indonesia -- and has recently swept across Asia. Last year Mahathir Mohamad stormed to power in neighboring Malaysia after promising to review Chinese investments, including a high-speed rail line. Myanmar has reassessed the price tag of a China-backed port, while Thailand’s opposition plans to review Chinese investments if it takes power after a disputed election. Tiny Maldives also booted a pro-China administration in a shift toward India. Prabowo has said he welcomes Chinese investment but it must also benefit Indonesia. He has vowed to review the high-speed rail project, and also to get a fairer deal in trade with Beijing. Indonesia’s trade deficit with China surged to $18.4 billion last year, up from about 40 percent since Jokowi came to power in 2014. China has presented a dilemma for Jokowi from early in his presidency. On the one hand, stronger ties with Beijing and billions of dollars in cheap financing help him bring jobs and overcome a shortfall of government revenue. At the same time, it risks fueling impressions that Indonesia is becoming too indebted to China, leaving him open to political attacks. Some Chinese investment in Indonesia is driven by economics, such as nickel mining in Sulawesi, Connelly said. But the high-speed rail project turned into a bidding war between China and Japan. “China offered lending rates and promises in terms of completion and delivery -- which it hasn’t fulfilled -- that were pretty extraordinary,” he said. Jokowi’s administration has said it would offer projects worth $91 billion to China with a focus on developing four separate economic corridors. In late April he’s scheduled to head to Beijing for a Belt and Road summit hosted by Xi. China is also backing several other big-ticket projects besides the high-speed rail. A $1.6 billion hydro-electric dam supported by the Bank of China has been proposed for North Sumatra. On the island of Borneo, a Chinese state-owned company is set to build hydro-power plants worth almost $18 billion. 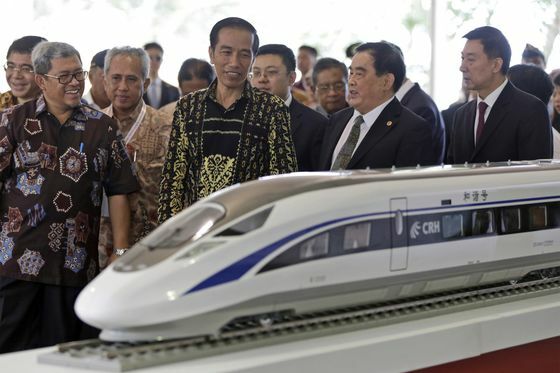 Jokowi’s campaign has sought to downplay his dealings with China, noting that former President Susilo Bambang Yudhoyono also partnered with the country on projects. It pointed to the Jakarta metro, which opened in March after three decades of planning, as an example of a partnership with Japan. “It is not true if people think President Jokowi has special preference for China-funded projects,” Ace Hasan Syadzily, a spokesperson for his campaign, said by phone on Friday. He also said the decision to build the high-speed rail “was taken with sound, prudent judgment,” even as he acknowledged the campaign wouldn’t be featuring the project in its bid to woo voters. In a debate Saturday night on defense, security and international relations, both Jokowi and Prabowo said they would significantly boost defense spending to better prepare the nation’s armed forces against any external threats. Chinese investment didn’t come up. Sandiaga Uno, a tycoon who is running on a ticket with Prabowo, said his campaign would push for Chinese investment that creates “good jobs” and “a fair deal” that benefits both countries. With nationalist sentiment running high and economic growth well short of the 7 percent growth promised by Jokowi when he took office, it’s a message that may resonate with an electorate already fearful of China’s growing economic clout. “We will get a better deal,” Uno said in an interview. Chinese investment “has to benefit the Indonesian people and it has to be rational,” he said. In 2013, during a trip to Indonesia, Xi proposed a broader vision that would become known as the Belt and Road Initiative a month after he first mentioned the concept of an economic belt based on the ancient Silk Road on a visit to Kazakhstan. Indonesia was among a host of developing countries that jumped at the chance to fast-track infrastructure plans. Lembong, the chairman of Indonesia’s Investment Coordinating Board, said he expected China to reboot the Belt and Road at the April summit to make it more green, more transparent and more professional. That desire to make the initiative a success will ultimately help projects like the high-speed rail, which will need to be expanded over time, he added.